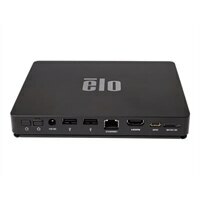 The Elo Backpack compute engine transforms touchscreen monitors and signage displays into commercial-grade systems capable of running audio and video content, interactive HTML webpages. The Backpack also supports advanced peripherals for scanning, payment, printing and biometric input. With potential to revolutionize the kiosk architecture, the compute engine simplifies delivery of content and enables remote management capabilities via the EloView portal.